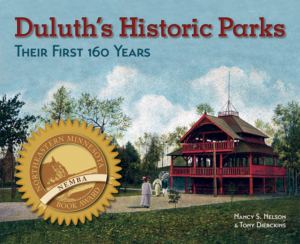 Between 1913 and 1925, eight Duluth parks were established and named in honor of members of the Lewis and Hepzibah Merritt family, true pioneers of the Zenith City. Family patriarch Lewis Howell Merritt (1809 to 1880) and his son Napolean arrived in Superior, Wisconsin, on July 3, 1855, having travelled from the family home in Ashtabula, Ohio. The Merritts were jacks-of-all-trades, and they had journeyed to Superior after they were hired to build a sawmill on Connor’s Point for Superior pioneer Newell S. Ryder. Their eyes soon strayed to the Minnesota side of St. Louis Bay, which had been opened to settlement following the 1854 Treaty of La Pointe. Lewis quickly made a claim near today’s Forty-second Avenue West, adjacent to land previously claimed by Reverend Edmund Ely and Henry Wheeler—both, like the Merritts, dedicated Methodists. The Merritts started calling the area Oneota, a word taken from a local Ojibwe legend meaning “the rock from which the people sprang.” The rest of the Wheeler, Ely, and Merritt families arrived in 1856. Over the years Lewis and Hepzibah Merritt (1812 to 1906) raised eight children, all boys: Jerome (1832 to 1878), Napolean B. (1834 to 1924), Lucien F. (1835 to 1900), Leonidas (1844 to 1926), Alfred (1847 to 1926), Lewis J. (1848 to 1929), Cassius Clay (1851 to 1894), and Andrus R. (1854 to 1937). 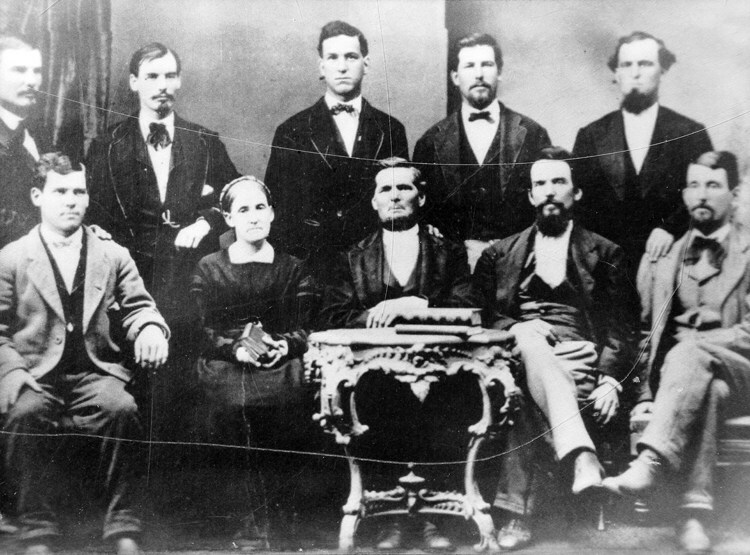 Not all of the Merritts remained in Duluth; by 1870 Lewis, Hepzibah, Napolean, Jerome, Lewis J., and Andrus had moved to Missouri; Lucien had gone to Ohio to become a minister and on to Pennsylvania to practice his trade. By 1880 Lewis H. and Jerome had died, and Hepzibah and Andrus returned to Duluth. Leonidas, Alfred, and Cassius never left the Zenith City. They worked as lumbermen, shipbuilders, sailors, timber cruisers, and mineral explorers. In 1889 Leonidas, Alfred, and Cassius finally heeded their father’s prediction and went looking for iron ore west of the Vermilion Range. In 1890 an expedition of six men led by Alfred Merritt discovered large deposits of soft hematite containing 65 percent iron. The Merritts named the range Mesabi, Ojibwe for “Giant Mountain” or “Grandmother of Them All.” They named their first mine Mountain Iron. Those Merritts involved in the iron mining enterprise have been called Duluth’s “Seven Iron Men” by biographers, but in reality the Merritts who engaged in iron mining totaled just five: Leonidas, Alfred, Cassius, and two of their nephews, Jerome’s son Wilbur and Lucien’s son John. Other family members, including Lewis J. and his son Hulett, also invested but did not participate in the operations. Creating infrastructure for their iron mining operation—including building the Duluth, Missabe & Northern Railway and its ore docks in West Duluth—proved expensive. The first load of iron ore was shipped to Allouez Bay in Superior in October 1892. It took until 1893 to deliver the first load of ore to the new Duluth docks, not far from where Lewis H. Merritt had helped establish Oneota thirty-five years earlier. But by then John D. Rockefeller had become the controlling investor in the Merritt’s enterprises. When the Financial Panic of 1893 shook the nation’s economy, Rockefeller called in his debts, and by February 1894 he essentially took control of everything the Merritts had built. Thomas Merritt, son of Napolean Merritt, honored Leonidas along with four other Merritt brothers (Alfred, Cassius, Jerome, and Andrus) by donating forty acres of land in the name of each to be dedicated as Duluth parks; these parcels are now part of Magney-Snively Park. Three Duluth parks still honor the Merritts: Merritt Park at 4017 West Seventh Street, established in 1913 as Merritt Playground; Napolean B. Merritt Memorial Park at 128th Avenue West, established in 1925 on land also donated by his son Thomas; and Reverend L. F. Merritt Memorial Park at 46th Avenue West and Superior Street, established in 1924 adjacent to the church named in his honor. Other Duluth landmarks bear the Merritt name. In 1911 pioneer Jerome Merritt—considered by many as the first teacher in what is now Duluth—was honored when a new elementary school at 510 North 40th Avenue West was named for him. In 1993 the building was converted to apartments. West Duluth’s Merritt Creek is also named for the family, following the tradition of naming local creeks after pioneers who homesteaded near them. The creek runs from north of Brewery Park roughly adjacent to Haines Road before entering the Denfeld neighborhood west of the Wheeler Athletic Complex and Wade Stadium before emptying into the bay near Thirty-fifth Avenue West.